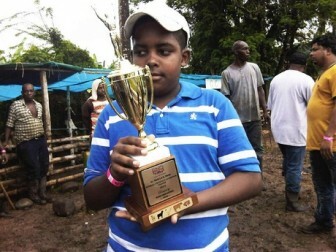 Twelve year old Shemar Pringle was awarded Champion Goat Farmer, at the St. Mary’s Agri Expo, for boasting the best goats in the parish. Shemar Pringle is working Big Wonders in Jamaica! This entry was posted in Agri Expo, Big Wonders In Jamaica, Culture, Jamaica, St. Mary, Stories from the Gleaner and tagged Agri Expo, Farmer, Gleaner Company, Goat, Jamaica, Saint Mary. Bookmark the permalink.